We woke up to a cold and drizzly day this morning in beautiful Beaune, but it’s definitely a nice break from the 100 degrees we’ve been enduring in Texas. Last night was the best nights sleep we’ve had since we got here. 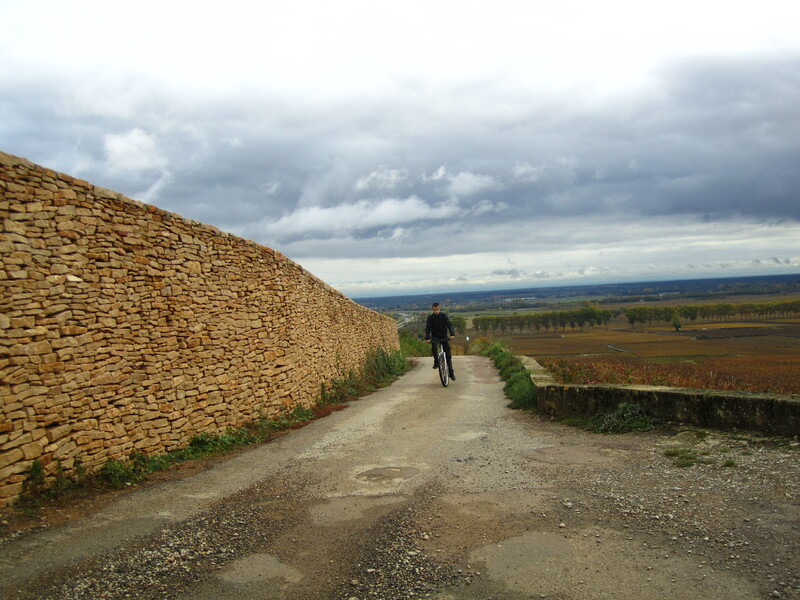 The dark stone walls of the hotel made for the perfect place to sleep soundly. Thankfully breakfast was served until noon so we made it just in time for some warm bread and cheese. 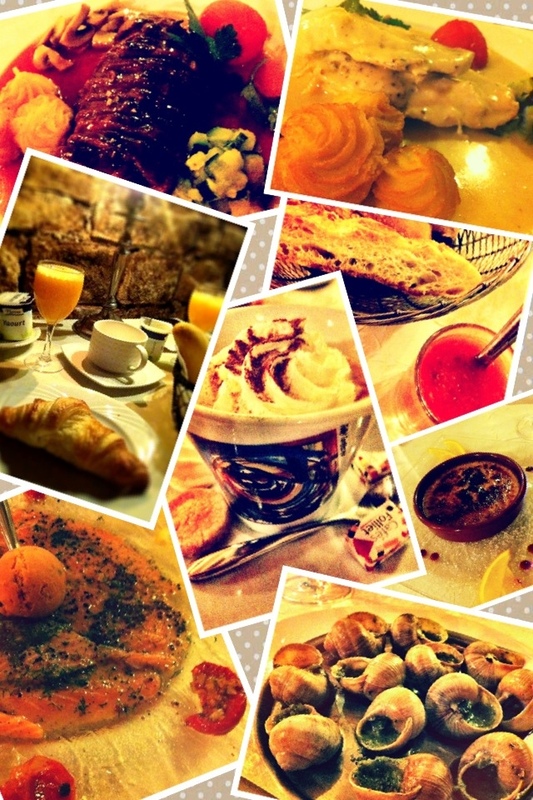 I’m utterly amazed at how much cheese and bread is consumed in France…and everyone is skinny!! I’m definitely not complaining, cheese and bread in the morning hasn’t gotten old yet! Today is our wine safari day!! We will be touring the beautiful Burgundy region and tasting some of the most illustrious Pinot Noir and Chardonnay in the entire world. 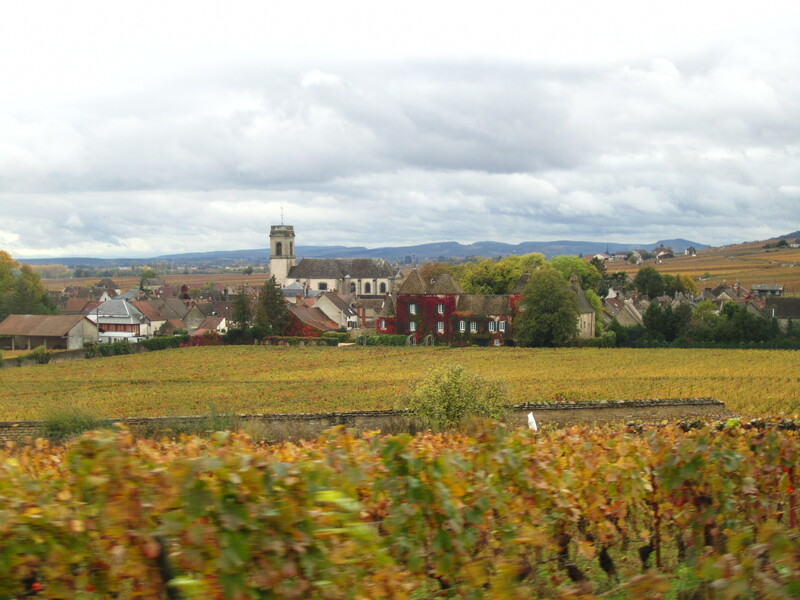 Burgundy is especially known for their Chardonnay. Mid afternoon we joined another duo in our safari van and headed into the wine country. The dreary day didn’t hold us back…in fact, it actually made for some beautiful pictures. 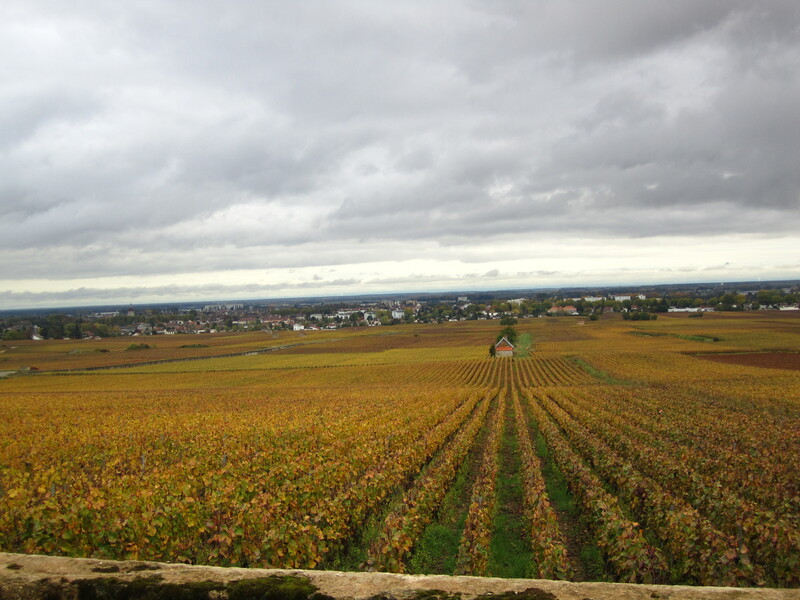 The changing foliage and vibrant colors of the vines really stood out against the gray skies. The harvest was about a month before we came and some of the vines were hanging on to grapes that didn’t make the cut. We were able to taste some Pinot Noir grapes and they were so absolutely delicious…cold and sweet. It was amazing to drive through all of the ancient villages and listen to the history of how the villagers make a living on wine. I asked our tour guide if many people leave or move in to the region. Her immediate response was “why would we ever want to leave”, and I definitely see why. 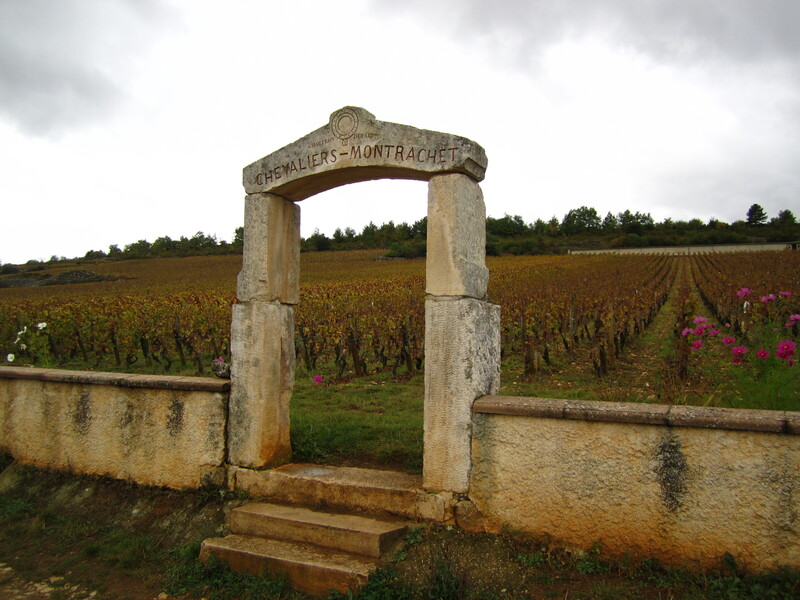 Not many people move into Burgundy unless they know wine. 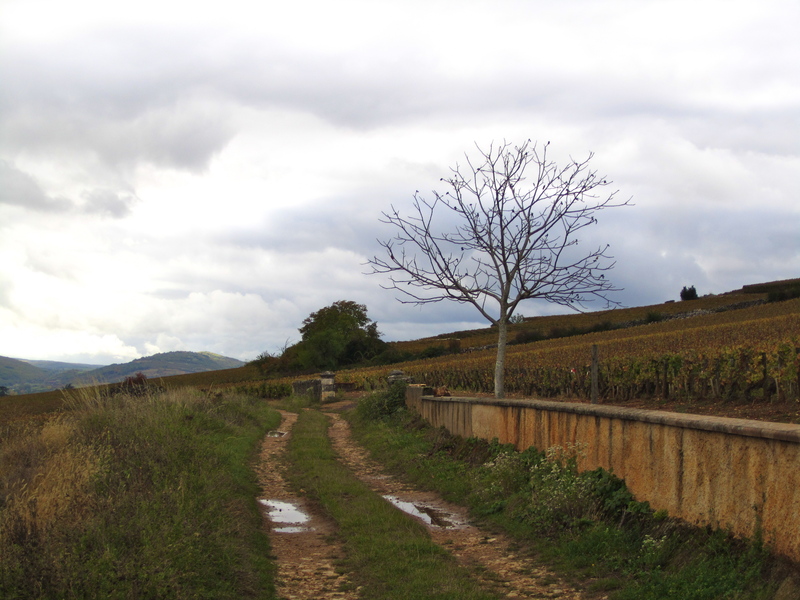 For centuries families have harvested the hills and produced the most decadent wine or “vin” around. It’s truly breathtaking. 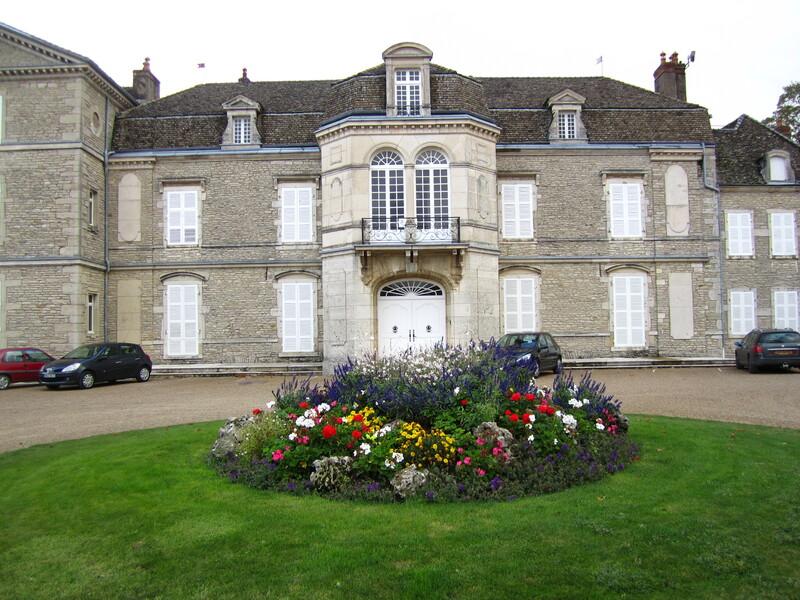 We completed the wine tour at the Chateau de Meursault for a wine tasting and tour of the Cave (cellars). 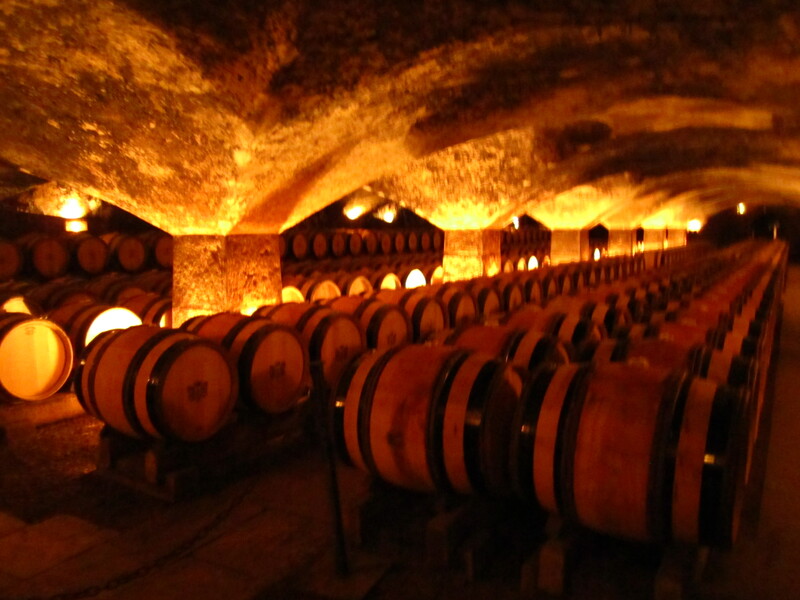 Walking through the cold cellars filled with over 800 barrels and 150,000 bottles of wine was quite a site to see. When you’re enjoying a glass of wine you rarely think about the livelihood around the origins and production of the wine. It’s truly a labor of love. 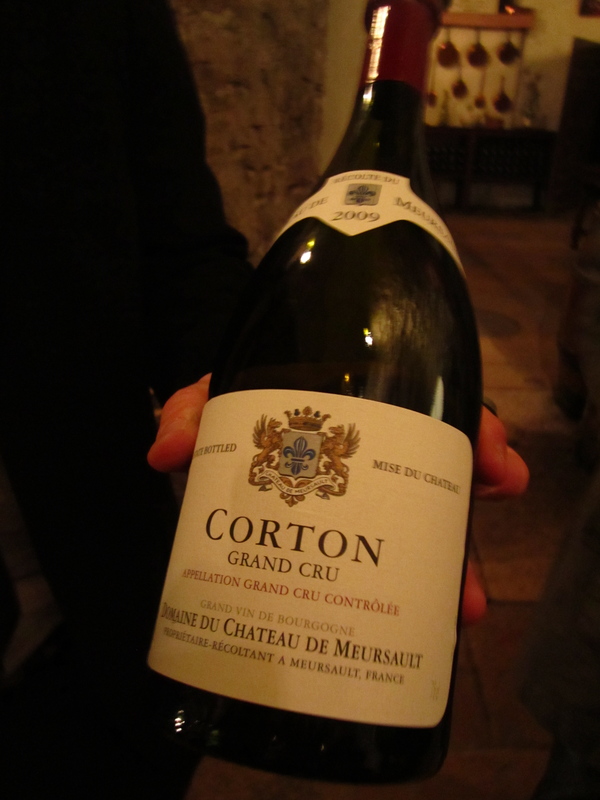 Our “sommelier” or wine expert started out with some of the least expensive and complex wines but ended with the Grand Cru and most exquisite of the all…the Corton Aoc Grand Cru, Pinot Noir. 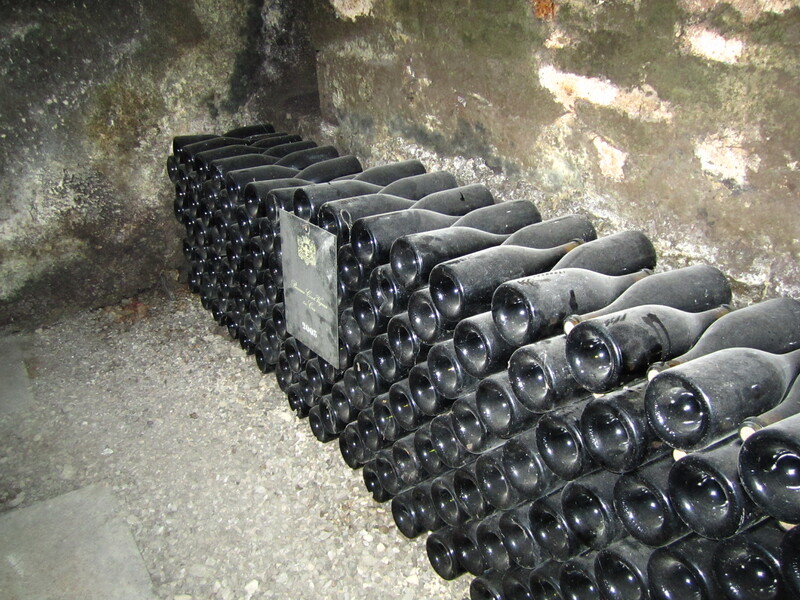 It was indescribable…the best wine I’ve ever tasted. So of course…we had to buy a bottle for our anniversary dinner tomorrow night!!! After an amazing day of tasting wine and seeing the beautiful countryside we headed back into town and extended our visit with the two ladies we met on the tour. They were from Canada and rented a beautiful apartment with their husbands for the week. After a few hours of bread, cheese, wine, and great conversation we headed back to the hotel for some rest before dinner. For dinner we headed to La Grilladine for the best meal yet. It was a cozy place with beautiful artwork, deep red walls lit by candlelight, and large ancient stoves heating up the room. Everything was exquisite. The Burgundy snails, definitely a highlight of each entree, were incredible. The salmon and sorbet was the most unique dish I’ve ever had. In a million years I would never think to pair salmon and sorbet but the coolness mixed with the marinated fish worked. Matt definitely won with his dish. My duck with the sweet raspberry vinaigrette was divine…but the chicken breast soaked in a creamy Dijon sauce was impeccable. Oh yes…and the creamy zucchini cake has become my next culinary mission when I get home….delish!! Both dishes were perfectly cooked. The duck wasn’t gamey at all and was cooked to perfection. For dessert we had to stick with tradition and try their creme brûlée and it did not disappoint. From the wine and starters down to the dessert it was a meal to die for. 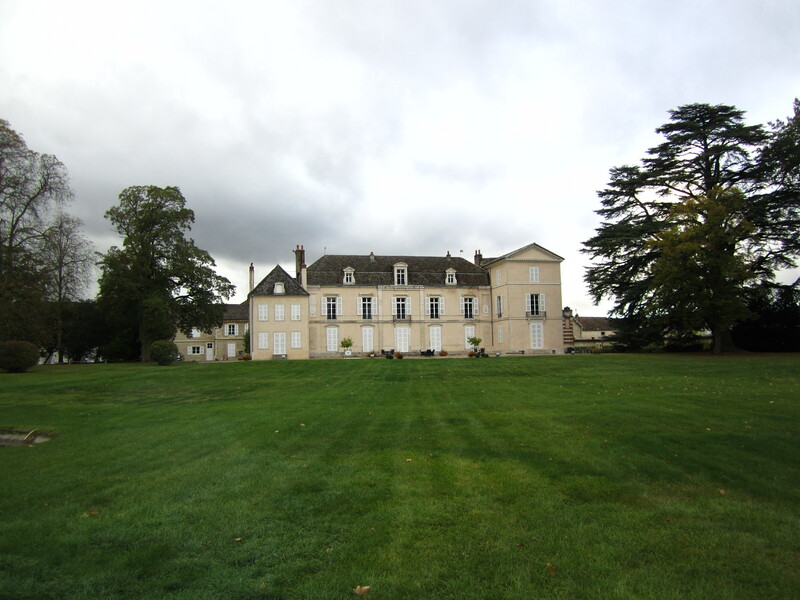 Tomorrow we have another lunch and wine tasting at La Table D’Olivier Leflaive. Now for some rest!